Did you know that around 30,000 people who submitted their tax returns for the 2016/17 tax year could be due a refund or face an unexpected bill? A software glitch and changes to the tax rules introduced in April 2016 led to HM Revenue & Customs (HMRC) making some errors when calculating personal tax liabilities. 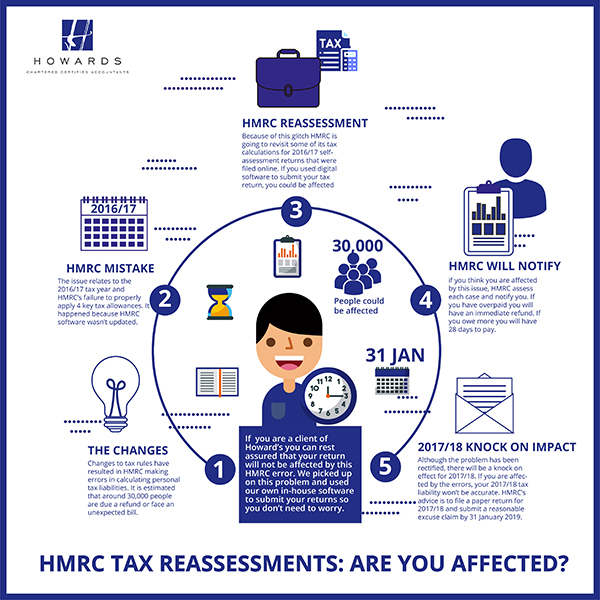 You will only be affected if you (or your accountant) used HMRC’s online portal to file your tax return or if you used HMRC-specification software. Rest assured that if you are a Howards client, we were fully aware of this issue and filed your returns with our own in-house software, so you will not be affected by this glitch. The issue relates to the 2016/17 tax year and HMRC’s failure to properly apply four key tax allowances. These include the Personal Allowance and the ‘Savings Starting Rate’, whereby tax-free savings interest of up to £5,000 is available dependent on earnings above the Personal Allowance threshold. Also part of the complex calculation are the Personal Savings Allowance, which gives basic rate taxpayers £1,000 of tax-free savings interest a year, and the Dividend Tax Reform, which limits tax-free dividend income to £5,000 per annum. Although HMRC acknowledged the problem and issued guidance, highlighting circumstances under which individuals should file a paper return, many people may have missed this since the briefing document was not available until mid-November 2017. As a consequence of this software glitch, HMRC has announced that it is going to revisit some of its tax calculations relating to 2016/17 self-assessment tax returns that were filed online. Some people will have missed out on tax breaks and, as a result, will have paid more than was necessary in relation to their tax liability. Others will have underpaid. If you think you’re affected by this issue, don’t panic. HMRC will assess each case on its own merits and if a correction is required, it will notify you. Those who have overpaid their tax liability in 2016/17 can expect an immediate refund. HMRC will send a demand to anyone who owes more in tax contributions, and then you have 28 days in which to settle the bill. Although the software problem has been rectified, there will be a knock-on effect for 2017/18. If you are affected by the 2016/17 tax calculation errors, you won’t have an accurate figure regarding your 2017/18 tax liability. HMRC’s advice is to file a paper return for 2017/18 and submit a reasonable excuse claim by 31 January 2019. You should estimate your tax liability for 2017/18 based on the information you have and pay any tax due, including a balancing payment for 2017/18 and first payment on account for 2018/19 by the 31 January 2019 deadline. We can assist anyone with concerns to secure concessions. For more information or advice about our tax services, contact us on 01785 243276.